A simple answer to that question can be found in the Einstein quote above. I've always been a reflective learner, which means I learn best when I can make personal connections to what I'm learning. It doesn't mean that I can't learn for the sake of learning, learn by practice, or learn by trying to apply the knowledge in new situations. (If you are interested in learning more about learning styles or find out yours, visit the 4MAT website here). 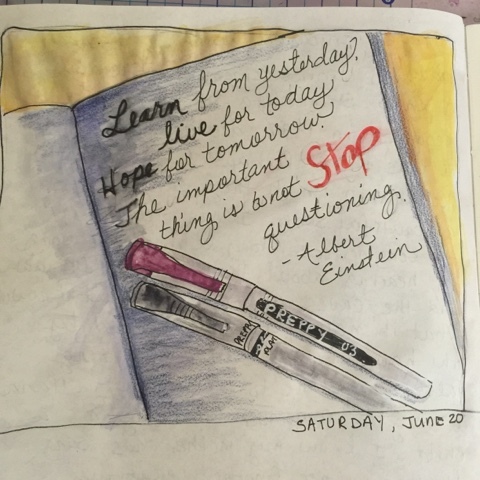 When I was a teacher, I was involved in a month long summer program in which I was learning about learning and one of the things I was supposed to do was to keep a journal to write my daily reflection. The facilitators that worked with us collected the journals on Friday and made comments and returned them on Sunday evening. In the beginning, I just wrote what happened, but that really wasn't being reflective and I wasn't actively trying to learn about how I learned. Over time, I begin to ask questions, started to wonder, writing down information and data. That's probably when I got the title, "Queen of Reflections" by facilitators and other teachers. 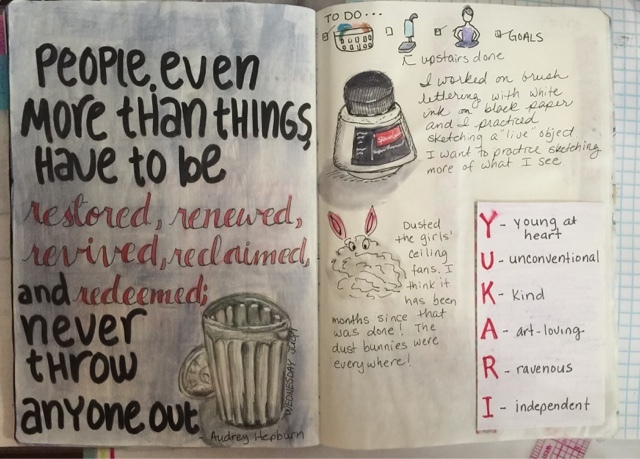 For me, journaling is a great process, not only for mind dump but also to challenge my own thinking. And unfortunately, I lost the art of journaling over time. As many of you know, I have a daily journal (Fauxbonichi) that for the most of the year serves as my planner/organizer/art journal. But over the summer, not much is happening and I have been lost about how to fill the spaces. There are daily drawing and writing prompts I can use, but those felt disconnected from my thoughts and feelings. 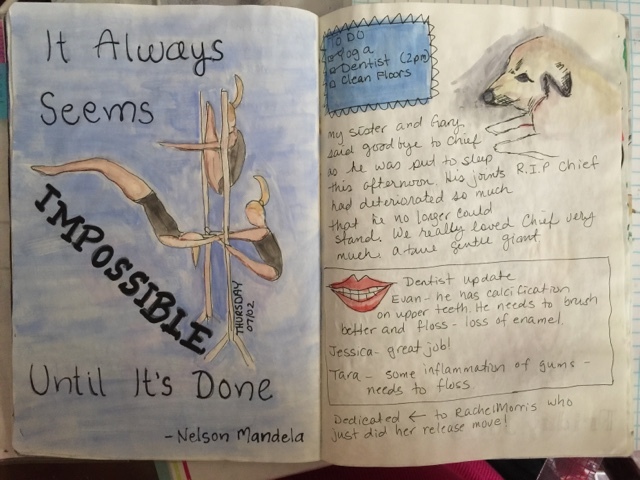 At one point, I quit sharing my pages because I had to think about how I wanted to journal. I didn't know it at the time but I was trying to get back to doing my reflection journal. 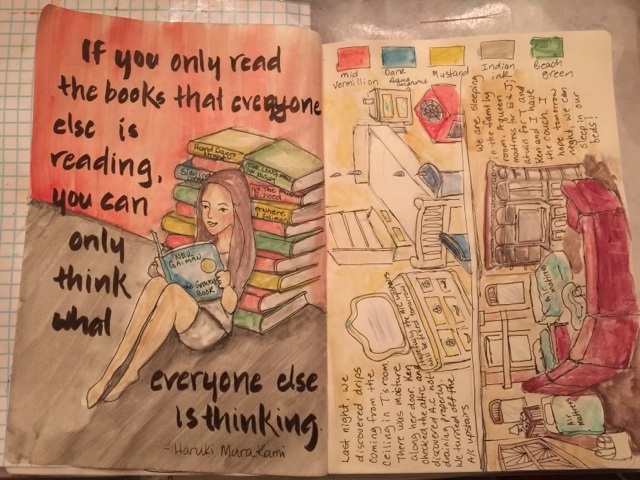 But in order for me to share my pages with a group (Fauxbonichi Journalers on Facebook), I had to figure out a way to separate personal thoughts and those thoughts I can share publicly. I finally decided to add additional pages that would allow me to write privately and remain hidden and still have pages I can share. Today, I wanted to share some of my pages and my thought processes. If you follow me on Facebook, Instagram, or on Google+, you see the art page I do almost every day like this. As I mentioned, we have two drawing prompts we can choose from. For this day, we were to draw a trash can. 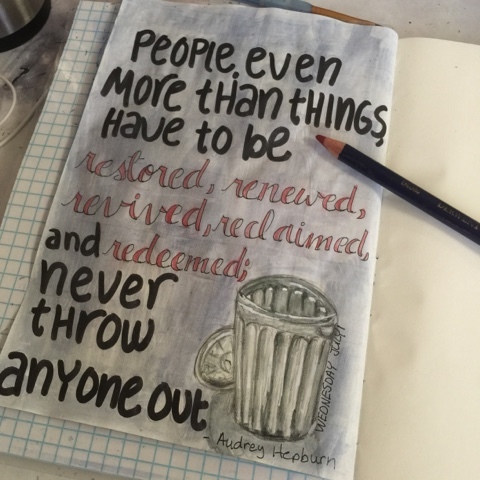 So I searched Google for quotes about a trash can and found the quote by Audrey Hepburn. And this is the main process for my daily art page. And as you can see, there is a blank sheet next to it. 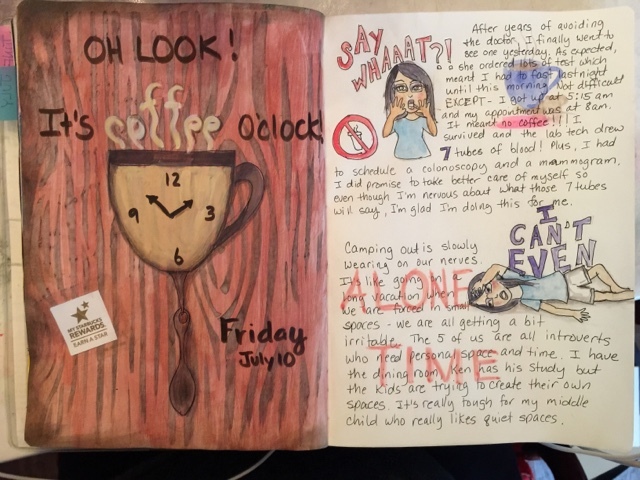 That's my journaling page. I usually share the 2-page spread on Fauxbonichi Journalers. If you look at my journaling side, there is not much there. 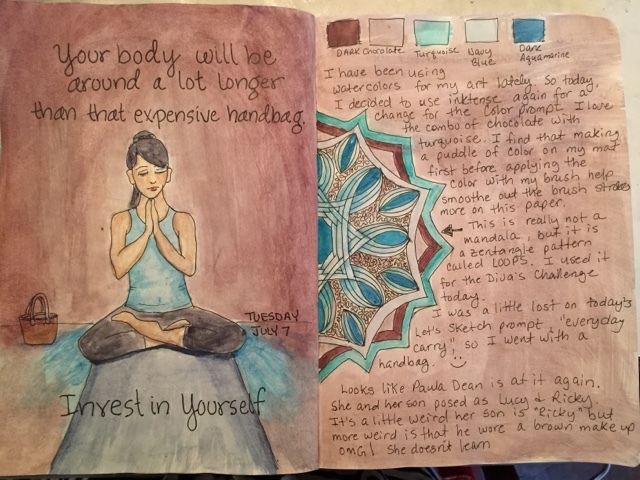 This is when I was ready to give up on this journaling thing. I wasn't gaining anything from this process except perhaps to practice my art. So I decided to add more pages to my day, so I can add meaningful journaling that can remain private while I still have things I can share. It's been working well for me. This was the day I was to use the quote and use to practice hand lettering. I immediately thought about one of my daughter's friends who just did a release move on the uneven parallel bars for the first time and I thought it would be perfect to illustrate the quote. I wrote a bit about the passing of my sister and her family losing their family dog. I was able to write more and include some photos of my kids with Chief on the private page. The drawing prompt for July 4 was a bench so I loosely drew one in a park and colored with watercolor. 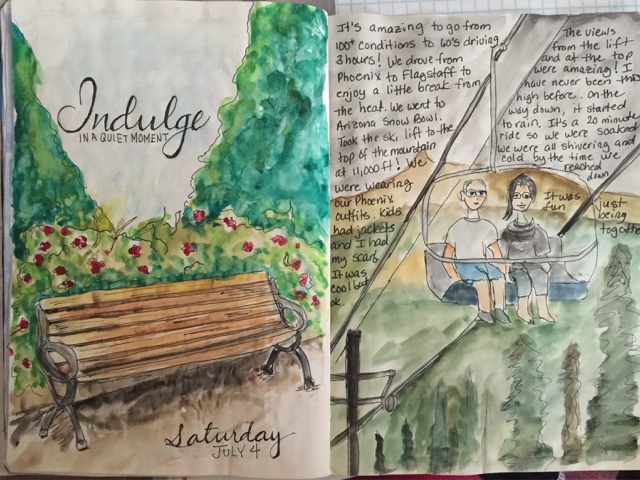 We had gone to Flagstaff for the day and I was able to describe and draw part of the day. This day's drawing prompt was everyday carry. Not quite sure what that meant so I chose a handbag. Searching for a quote about a handbag led me to this quote. It seemed perfect for me as I'm trying to lose weight and be healthy. I have been doing yoga almost everyday. As you can see, I'm writing more now. For this day, I was to draw what I'm currently reading. I even used my youngest to be my model for this art. If you look closely, you can see the titles of what I'm reading. And on the other page I describe a house issue we encountered. It was a stressful day, but it helped me to draw and to journal. For this day, I was to draw a clock. I wanted to include coffee so I found the quote and drew. This day, I wrote almost two pages worth of observations and deep reflection. It really did help me deal with anxiety about going to see the doctor. And finally, this was my page from yesterday. It's very different from my normal art.. But I feel like I'm learning again. So yes, I'm enjoying the process. I think it's important for everyone to have an outlet. For some of you, it's talking to your spouse, your best friend, your siblings. For others, it's writing, or other creative outlet. 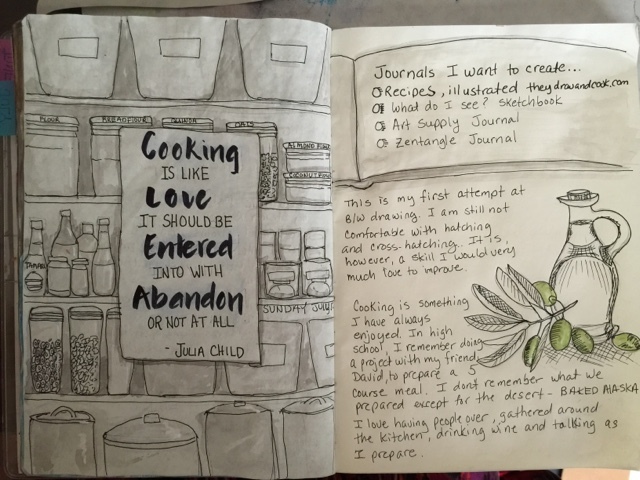 For me, my art and journaling help me to process my thoughts, feelings, observations and beliefs. I hope you have an outlet too. Angelcake, I love your art. I love your choice of quotes. I love your warmth. I love your humor. I LOVE YOU, Ms Kari! I just love your art. you are so pure with thought and beauty.